Murt camping barn is a stone tent situated in Nether Wasdale. It provides basic dry accommodation for up to 8 people and takes the form of a converted farm barn with basic amenities. You will need to provide everythng you would normaly take camping with you except the tent. The barn will provide dry accomodation with hot and cold water, showers and washing up facilities, and outside there is a BBQ for residents use. 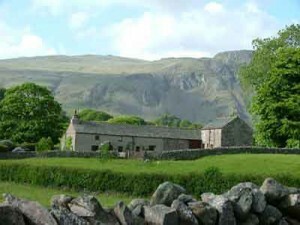 Murt provides budget accommodation in Nether Wasdale and is conveniently located for Wasdale, Scafell, Water Water, Gosforth and Eskdale, great location for walking and climbing. “We do not suggest you use SatNav!”. At T junction turn left down hill, then first right signed to Wasdale. If you pass pub, The Bridge Inn on your right, you have gone too far. Go past The Old Post Office Campsite on left. This road takes you up through woods and then down a long gradual hill, white house on right (The Flass), very sharp left bend over bridge. Immediately after bridge turn right, past cottage on right (sawmill) to junction. Bear right at this junction, (telephone exchange is opposite left).